Today's Nice Price or Crack Pipe 405 is appropriately painted a shade of French blue. A popular car in its time everywhere but here, it's now a rare sight no matter what the hue. Regardless, let's find out if its price makes this one French in Action! How fast did yesterday's 1971 Nissan Bluebird 1800 SSS Coupe achieve its 80% Crack Pipe loss? Yes, that's right, dat-soon. Dat-soon is of course the correct answer. I'll see myself out. Hey remember last week's 3-row Peugeot 505 that came with its own parts car as well? That one wasn't too expensive and it was French as all Hell. But what if you didn't need an extra car and still wanted to get you Franco-American, uh-oh Peugeot-ee-oos on? Today we have just the thing for that, the 505's little brother, a 1989 405 sedan. Mon dieu! Okay, confession time. There is a 405 that runs around my neighborhood - a four-door like this but painted red - that is driven by a middle-aged woman who has chosen to fit the car with… comical eyelashes above the headlamps. I defecate you in the negative. This one lacks any form of eye makeup, but it does have a windshield banner that spells out the cars brand and gives it the appearance of a chef at Benihana. Another aspect of the 405's appearance is how similar it looks to the contemporary Alfa Romeo 164. Both designs were the work of Pininfarina, and both have also held up amazingly well over the years. Aside from the side marker lights and slightly more pronounced bumpers, the American 405 looks identical to its European frères. 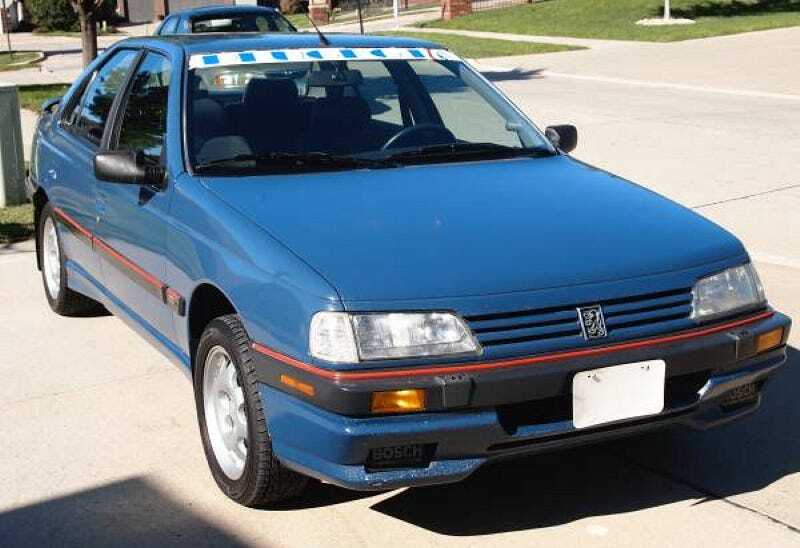 These represented a concerted effort on Peugeot's part to build a car to successfully meet the U.S. market needs, but it was all for naught as sales never met expectations and the entire brand rolled up the carpet and went home after the '91 model year. They left behind some interesting rides, cars like last week's 505 and this 405. This one offers up a 110-bhp (from the factory) 1.9-litre, 8-valve four and a 5-speed stick. It's the luxury-oriented DL edition which means it's optioned to the eyeballs. Sadly it's not the sportier Mi16 with its twin-cam mill. Still, less to go wrong, right? The body looks to be in good shape, with the only apparent major issue being some peppering of the front valance. Other than that it seems clean and without evident flaws. You might recognize the alloy wheels upon which it rolls, as those also used by the lovely and lust-worthy 205 GTi. On to the inside and things looks just as good on this one-owner Pug. The thickly bolstered seats seem to be intact as does the dash and door trim. The ad notes the presence of a Blaupunkt stereo, which… well, I don't know if I like the idea of a German radio invading a French car. Easy enough to change, I guess. The car has a remarkable 190,000 miles on the clock. I think that's a noteworthy amount to have amassed considering the car's present condition, and the fact that it's a Peugeot 405 in the U.S.. Some of the bits haven't been around that long, as the ad notes a new battery and newer tires as enticements. What's all that worth? Well, the asking is a nominal $1,950 and honestly, at any price you're just not going to see that many of these here in the States any more. If you want one, this looks to be a decent opportunity. But is it a good value? What's your take on this Pug's $1,950 asking price. Is that an amount that should have a buyer saying baguette up, I'll take it? Or, to be Franc, is that just too many dollars? Omaha NE Craigslist, or go here if the ad disappears.